The Ashland APLI Series Lint Interceptor is designed to capture line and debris from commercial washing machine discharge. Made of High Density Polyethylene (HDPE), the Ashland APLI series interceptor is lightweight, cost efficient, extremely durable, and corrosion free. Non Skid poly covers are standard. All units are available with diamond tread plates for heavy foot traffic areas. The HDPE construction can withstand corrosive effluent from laundry waste and the smooth walls make cleaning effortless. Above or below ground installation. 1/4" Steel covers for pedestrian traffic. 3/16" Aluminum overlays for light foot traffic. Optional connections sizes; 2,3,4, and 6 inch. HD braces required on larger models for above ground installation. Recessed lift handles standard on 3/4" poly lids for 100-350. 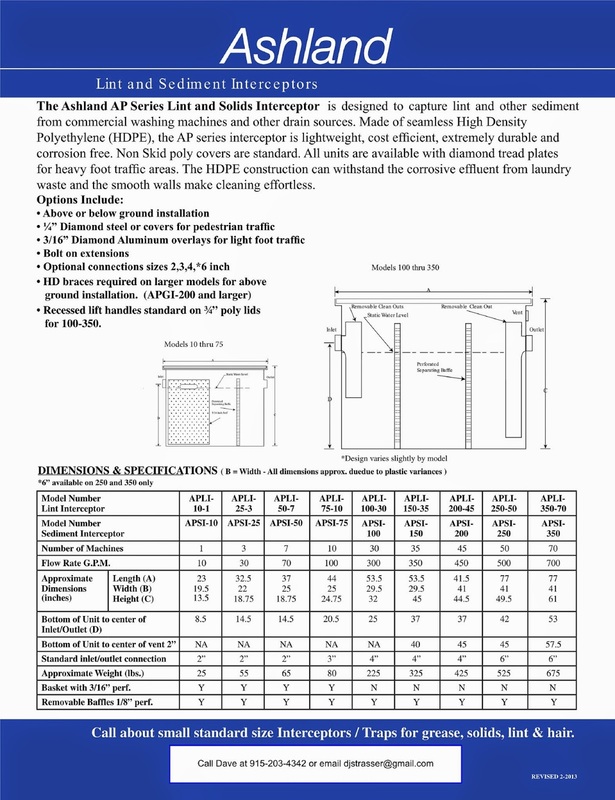 Special sizes are available to fit through narrow passages or existing walkways. Special units are also available to meet larger capacities, including systems that utilize series and/or parallel interceptors. Straight through, left, and right hand models available.